Being a well established-organization, we are engaged in providing a distinguished range of L Seal Cutting Machine that is widely used for lot production pipelining with high efficiency. SPLS-5545A has a tight lock device especially designed for packing small products. There is an organic glass safety cover with alarm function around the sealing & cutting part of this machine in order to ensure the safety of the operator. The L-seal cutting machine is suitable for lot shrink wrapping in various industries, such as software, foodstuff, cosmetics, printing, pharmacy, flooring, ceramics, beverage and hardware etc. 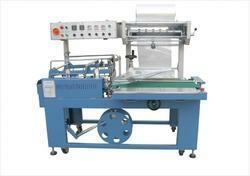 Looking for L Seal Cutting Machine ?